Are You a Woman in Need of New Hiking Shoes? Are you a woman? Do you need hiking shoes? If you answered yes to both of those questions, look no further than this article! I am going to review the 5 best hiking shoes for women currently on the market. First, I will walk you through 6 of the most important factors when deciding on the perfect shoe for you! This will give you some idea about what you are looking for prior to reading the reviews. 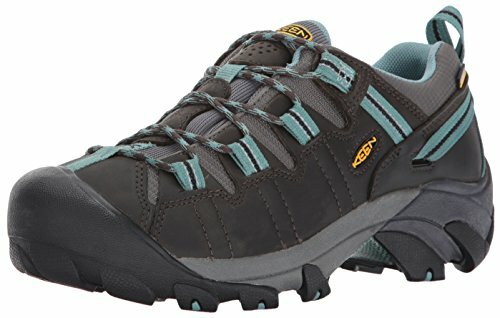 Conclusion: What Are The Best Hiking Shoes for Women? 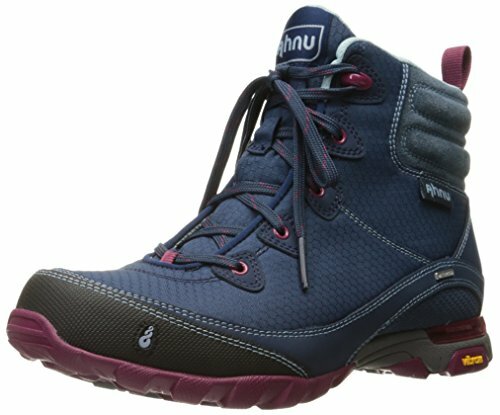 Best All-Rounder Hiking Shoes for Women. 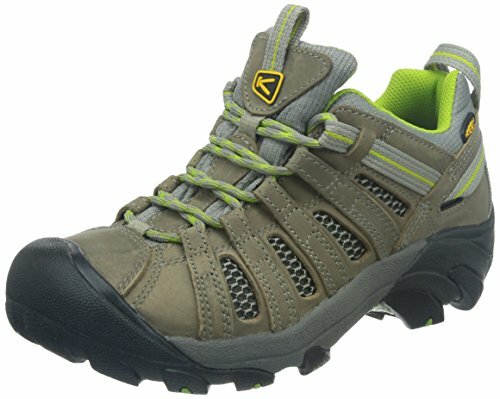 Although it was a difficult choice, I chose KEEN Women’s Voyageur as the best hiking shoes for women overall. My favorite thing about these shoes is their durability. They are made of leather, and feature a non-marking rubber outsole. I never have to worry about scuffs or weird colors on these Keens. The upper layer of the Voyageur is made of highly breathable mesh. My feet tend to sweat a lot when I hike. If you are like me, mesh is a great thing for ventilation! Another positive attribute of these shoes is how much arch support they offer. The secret lies in their dual-density compression molded EVA foam. The midsole has never felt so comfy! These mid-height hiking shoes also feature patented toe protection. I have found toe protection is key when hiking in rocky, uneven terrain. I have stubbed many a toe in unprotected shoes. 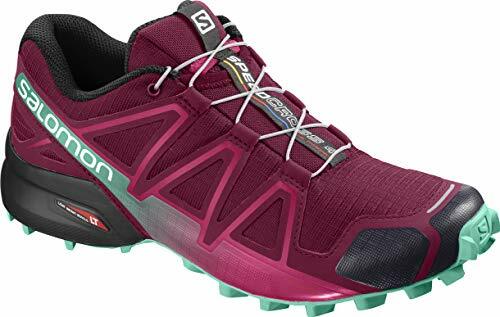 The winner of the best lightweight hiking shoe category goes to my favorite trail running shoe, the Salomon Women’s Speedcross 4 Trail Runner. This shoe weighs in at 260 grams. That’s .57 pounds. Even if you are not going to use the Speedcross 4 for trail running, it works great for hiking as well. These shoes feature precise foothold technology. That means no matter what the activity, you will feel one with the trail. One thing I find unique about the Salamon Speedcross 4 is its sensifit technology. This technology surrounds the midsole lacing system to provide a secure and snug fit for your foot. Sensifit makes your shoe practically customizable! The midsole is made of molded EVA and injected with EVA. I promise this is one comfortable shoe with great arch support for most people. Not only that, but quicklace makes it easy to tighten and losen your shoe for easy on and off! I quite frequently hike trails that feature slick rock, so I am always trying to find shoes with a great grip. These Salomon’s offer aggressive grip for more technical trails, running or hiking. Even the outsole is made of wet traction contragrip! The best waterproof hiking shoes for women award goes to the KEEN Women’s Targhee II! Although many other shoes on our list are waterproof, I have found the Targhee II outshines the rest. One thing I love about these Keens are the roomy toe box. A bit of extra room comes in handy, because as you hike your feet swell. I can even wear thick socks with these shoes. Another great feature of the Targhee II hiking shoe are the higher sides. I have found these come in handy when crossing minor streams or snowmelt. The sole is synthetic, and the shoe itself is made of nubuck leather and textile for maximum waterproofing. The contoured heel lock comes in handy when your feet are an inch deep in water and you don’t want to slide on the bottom. Furthermore, Keen included their S3 heel support structure to help prevent ankle injuries. In addition, you don’t have to worry about smell. These Targhee II shoes feature Cleansport NXT. This controls odor naturally, so you don’t have to worry about your feet soaking up chemicals. Since my feet sweat so much, I appreciate Keen including dry liner in their shoes to wick away the unwanted moisture. These shoes also feature a stability ESS shank. As with the other shoes on our list, the midsole is made of EVA. Your budget should not prevent you from doing what you love to do. Fortunately, Merrell agrees with me and released the Moab Ventilator Hiking Shoe. It is not difficult to find these shoes for under $80. If you are looking for a low hiking shoe, the Moab Ventilator is a great shoe for you! If you are looking for a shoe with great ventilation, this Merrill shoe is also a great pick for you! My feet sweat and my ankles are low, so this is a two for one! I find this shoe to be extremely comfortable with its Ortholight footbed, cushioned tongue, and padded collar. This is another hiking shoe that features technology to keep your shoes fresh. M Select Fresh features microbials to keep your shoes fresh! If you want a hiking shoe with a good grip, this Ventilator features a grip suitable for Moab! The deep lungs and Vibram sole make this shoes grip one of the best in my opinion. When reviewing hiking shoes for women, I cannot forget to include the best backpacking boots for women. The Ahnu Women’s Sugarpine Hiking Boot is the winner of this distinction! Why? For one, the Ahnu Sugarpine is a waterproof boot that also can boast breathability. Although the outside of the boot is made of leather, the inside features a breathable membrane. I feel these balance each other out to keep my feet dry! You will find the Sugarpine to be comfortable, because it features dual density EVA. This insures the heel and arch support will help you feel less shock in your feet. I also appreciate the arch support created by the integrated nylon shank. Another positive attribute of the Ahnu Sugarpine is its non-slip Vibram soles. These outsoles are not only slip resistant, they are also non-marking so you don’t have to worry about scuffs from rocks or branches. 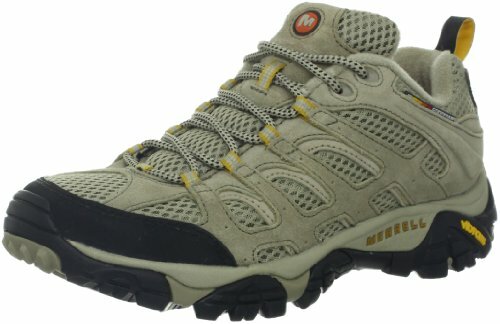 If you are like me, you have a hard time deciding what hiking shoe to buy. 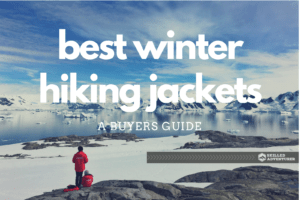 However, I put together this guide to help us all understand the most important factors to consider when deciding on hiking shoes. Enjoy! I believe the most important factor when buying hiking shoes is support. Take it from me, you do not want a shoe that does not offer your foot enough cushion from the shock it experiences on the trail. If you are planning to use your hiking shoes for backpacking, you will want to buy shoes with maximum support. Your feet will feel much better if they are properly cushioned, regardless of the weight on your back! Hiking shoes with EVA are great, because they will absorb shock and cushion your mid-sole. For extra support, some shoes include internal supports such as shanks. This will add stiffness to the middle of the sole. Be sure inserts surround the shanks for maximum comfort. Where you are planning to use your shoes the most will be a primary factor in what type of hiking shoe you choose. Are you going to be in a dry climate or a wet climate, on rocks or on sidewalks? If you live in a wet or cold climate, you will want to purchase waterproof shoes. On the other hand, if you live in a dry climate or plan on hiking in the heat, you will want to prioritize breathability. Do you plan to hike on rocks, wet leaves, or sand covered anything? If so, choose a hiking shoe that offers the best traction you can find. If you want to use these shoes for canyoneering, research and choose the shoe with the very best track record of grip. Lightweight tends to be better when buying shoes for outdoor use. If you haven’t bought new hiking shoes for a couple of years, or have never bought hiking shoes, you will be surprised by how far lightweight material technology has come. There are a few situations I have encountered where weight matters more. I have found it is best to go as lightweight as possible if you want to trail run. Bulky shoes will trip you up. If you are going on a long hike, you will want to minimize weight to maximize energy. If you plan on using your hiking shoes around small amounts of water such as snowmelt or puddles, you will want to invest in a waterproof shoe. If you plan to hike in the rain or wet conditions, you should definitely buy a waterproof shoe. Your feet will thank you later. However, if you do not plan on hiking in wet conditions, you do not need to worry about purchasing waterproof shoes. I used to live in the desert, and my shoes were definitely not waterproof. Nonetheless, if you come up against a situation where you need a waterproof shoe you can just buy some waterproofing spray. I have had to do this myself, and the spray kept my feet nice and dry. The best way to insure a good fit is by trying the shoe on before you buy it. You really do want to make sure the hiking shoe you are buying is not too big and not too small, not too wide and not too narrow, and not too cushioned and not too flat. Of all of the factors, I believe budget should be the least important. However, I am not rich either, so whether or not I like it the cost of the hiking shoe does come into play. How often do you plan on hiking? If you only plan to go out once or twice a year, you do not need to spend a lot of money on the highest quality hiking shoe. However, if you are a weekend warrior, I would advise you spend a little more to get a better product. I always purchase my most expensive hiking shoes on sale. Check out this video for more tips and tricks on how to choose the best walking shoes or hiking boots. 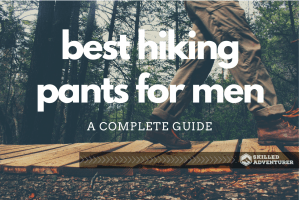 Whether you are new to the world of hiking or a pro, it takes a lot of time and research to find the best hiking shoes for your circumstances. 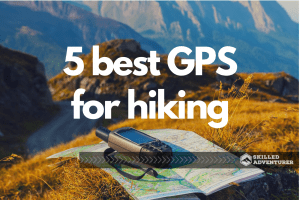 Every outdoorswoman must have her hiking shoe, and these are 5 of the best hiking shoes for women. However, only one shoe can be the editor’s pick! For many varied reasons, the winner of the roundup is the KEEN Women’s Voyageur Hiking Shoe. I will explain why I own these shoes, and why I would purchase them again. When compared with the rest of the hiking shoes on my list, the Voyageur emerges as the best bang for your buck. For a decent price, you can get a quality hiking shoe that does not skimp on the traction or arch support!